In February, the Congress of the Scandinavian communalist organisation Democratic Alternative, backed the Oslo local group’s initiative to participate in local elections this autumn. What has for a long time been a subject of discussion in the organisation can now become a practical vision of a democratic alternative in the public realm. The aim of participating in this election is mainly to promote the group’s and the organisation’s ideas of direct and participatory democracy and establish a broader discussion. The purpose is not at first to win any seats at the present. The focus will be on citizens governing by themselves. The programme will have a clear libertarian socialist and ecological profile. It could build upon the campaign for participatory budgeting that has been advocated over the last few years and maybe push for referenda on certain issues. To stand in the elections the Oslo group needed 300 signatures before the 31st of March, in fact they collected 500. That means that they will be on the election list in September and the campaign will be running during the summer. The annual Congress, held at the end of the February, saw Democratic Alternative regaining its strength after a 3 year period of decreasing activity. The organisation was formed in 1999 by environmentalist activists and left radicals in Norway tired of a single issue focus and the traditional left’s parliamentary strategies. They were inspired by social ecology (ideas of) communalist politics and the organisation grew substantially between 1999 and 2003. They believe in moving (the) political and economical power to the local level by creating decentralised political institutions in local communities where people can meet, discuss and make decisions. The plans for 2007 look hopeful. The book “The Politics of Social Ecology – Libertarian Municipalism” by Janet Biehl is being translated into Swedish, Norwegian and Finnish and will be published in the autumn by Democratic Alternative’s own publishing house “Frihetlig Press” (Libertarian Press). A release tour will be organised to launch the book. The Democratic Alternative website, that has been stagnant for a period of time due to technical problems, is being redesigned and will now be regularly updated. The group also came to the sensible conclusion to let go of some of the high ambitions that they haven’t been able to meet in the last few years. They will not publish a full size magazine but instead a newsletter with articles four times a year and they reduced the number of positions of responsibilities within the organisation. There was a strong sense of the need and will for good communication and cooperation to inspire and connect the organisation which mainly consists of spread out individuals and is small at present. The aim is therefore that everyone will be part of a group that has regular contact. Material with advice about starting up a local group will be produced to encourage groups to be started. The feminist action plan for participation on equal grounds was reworked to be less diffuse and more based on real activities. There are also plans for study circles and a few other activities that will be reported on during the year. There is a determination to create a dynamic organisation and the future looks very promising. Not least the participation in the Oslo local elections that is very exciting for everyone and something that brings them together in the hope and burning desire for a future of social freedom. A collectively authored volume that provides a unique conceptual framework for understanding contemporary US society and history, and developing a dynamic vision and strategy for social change. The authors combine and transcend various theories of history (marxism, anarchism, feminism, and nationalism) to develop an alternative conceptual framework, complementary holism. Applying this framework to questions of economics, politics, gender, race, and culture highlights the usefulness of complementary holism for understanding society and strategizing its transformation. Liberating Theory provides concepts that promote “autonomy within solidarity.” It rejects the idea that any one oppression is primary while all others are secondary and it provides a vehicle for activists to share intellectual tools, visionary aims, and practical strategies so as to support and work with one another without compromising the integrity of their own desires. In short, From Urbanization to Cities “is a historical exploration of civic self-management and confederalism. This book also gives an overview of Bookchin’s program for a direct-democratic and confederal politics, which he calls libertarian municipalism. 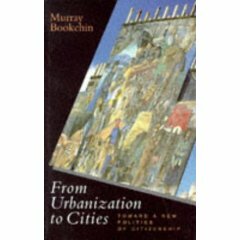 ” Bookchin reviews the history of “politics”, by which he means true civic engagement, from Athens to various cities in Italy. He also examines the role of leagues between cities in Europe, highlighting the history of libertarian and municiple political organisation. Bookchin challengs Marxist theories of development of the nation-state and the formerly assumed direct relationship to capitalism, giving us an understanding of the rich history of non-state political systems. The overall effect is one of optimistic, as the modern nation-state emerges as anything but inevitable and Bookchin outlines a plan for making cities livable public spaces again. Note: This book is out of print, and we had to order used copies online. Please feel free to borrow a copy from one of us.